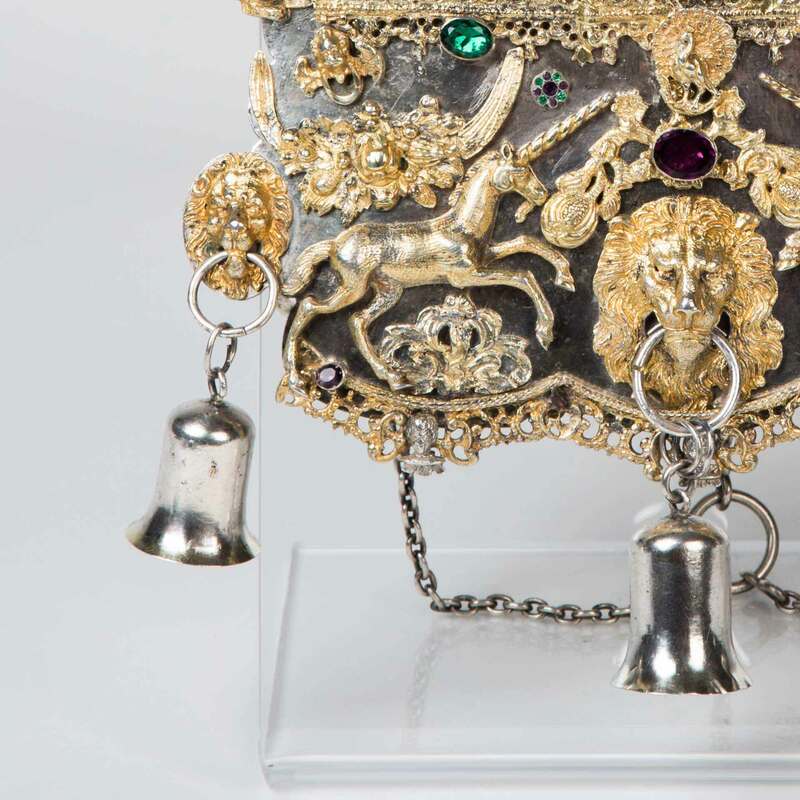 This lavishly decorated Torah ornament is one of the oldest extant Torah shields in the world and it has a remarkable family story. 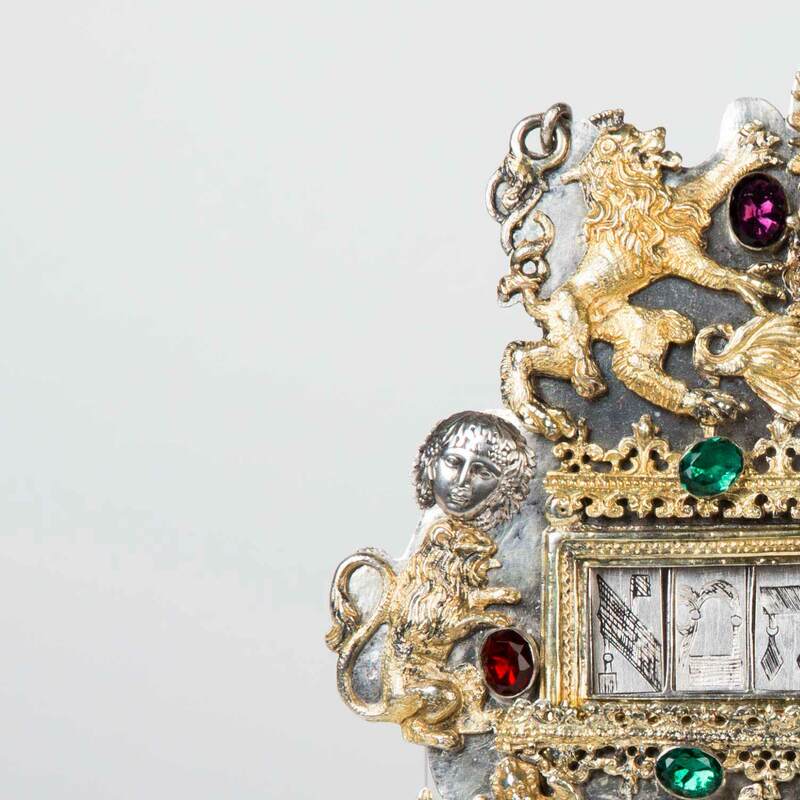 This 17th-century Torah shield (in Hebrew, tas) is decorated with semi-precious stones, cast lions, unicorns, and double-headed eagles. 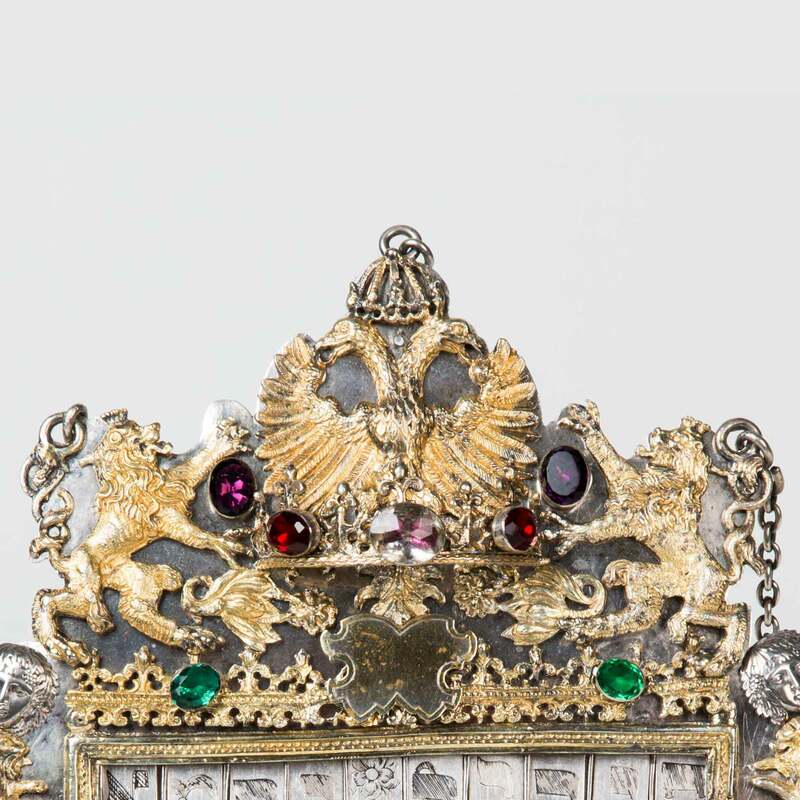 Those familiar with Torah shields will note that it lacks the standard iconography of Temple columns, Tablets of the Law, or the Star of David. This is because a standard form and repertoire of symbols had not yet developed at this early date. 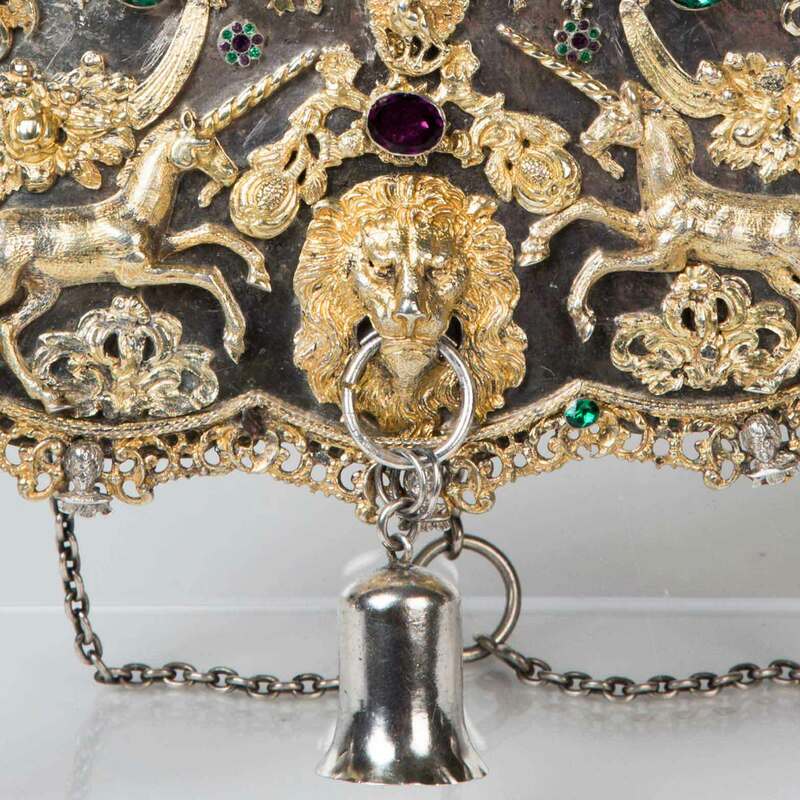 In addition to serving a decorative purpose, the shield was also a functional item. Its interchangable letters were used to indicate which scroll was designated for each holiday or Sabbath reading. 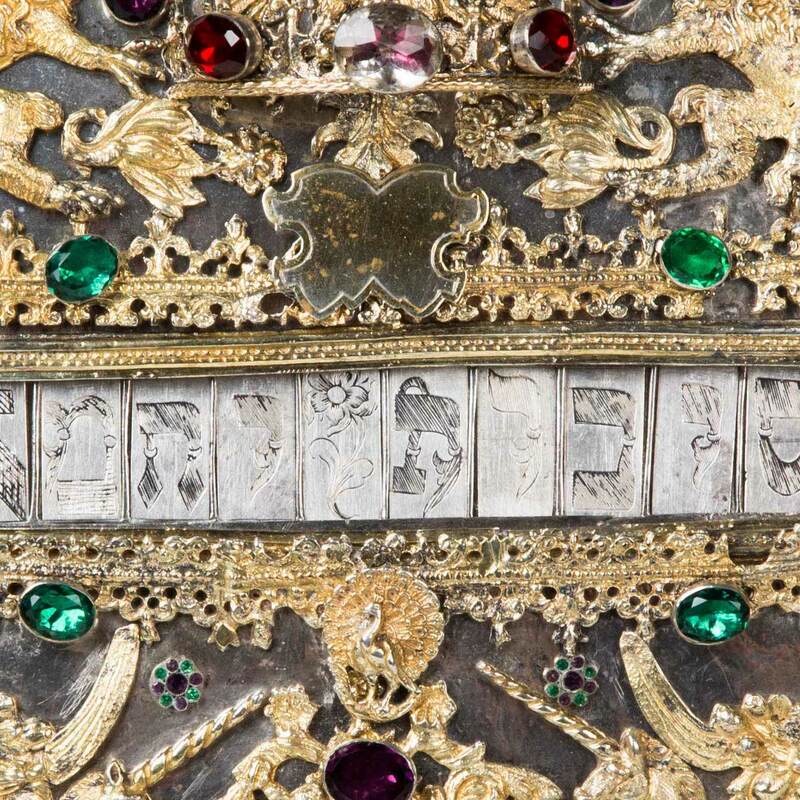 The shield is also noteworthy for its remarkable provenance. It was owned by the Dottenheimer family of Gunzenhausen, Bavaria, and lost during the violent pogrom of November 9 to 10, 1938, known as Kristallnacht ("Night of Broken Glass"). The only member of the family to survive the war was Joel Fredi Dotthenheimer, who had left for America in 1937. His postwar efforts to locate his family’s treasured shield were unsuccessful. In 1990, 52 years after its disappearance, the shield resurfaced. 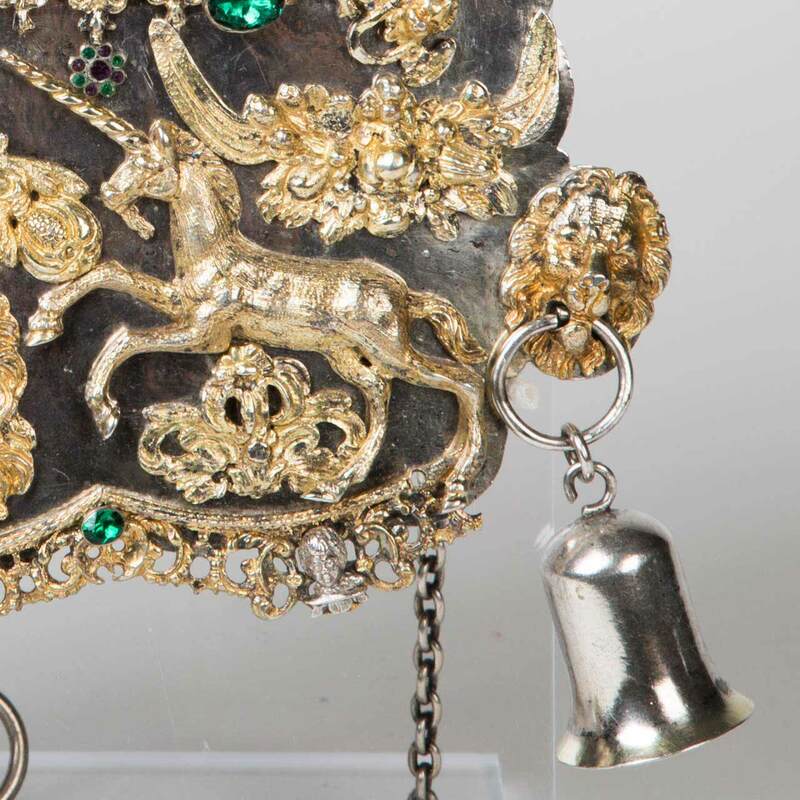 Spurred by the announcement of the founding of a Jewish museum in Fürth, Bavaria, a local man, whose father-in-law was said to have been a Nazi storm trooper, presented the shield to curator Bernhard Purin. After extensive research Purin discovered a photograph of the shield in an archive of prewar photos in Jerusalem. A notation on the back of the photograph indicated that it belonged to the Dottenheimer family of Gunzenhausen. When Purin searched for a shortened version of the name he discovered a living descendant, Steven Robert Dottheim of Jefferson City, Missouri. The shield was returned to Mr. Dottheim and his sister, Faye Dottheim Brooks, and placed on long-term loan at Spertus Institute. The loan agreement specifies that the family may borrow the shield for special family celebrations. 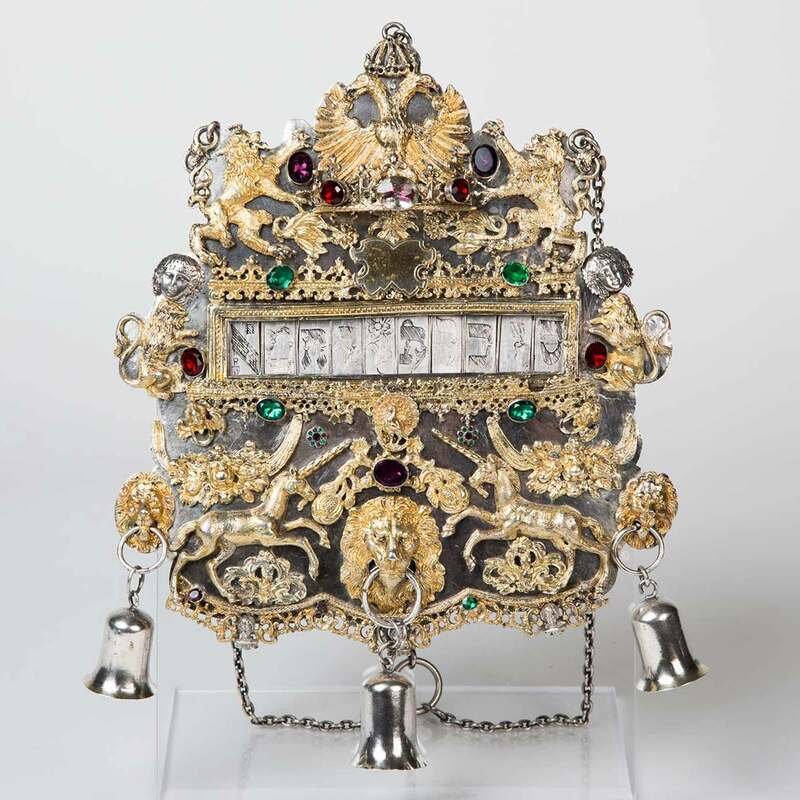 Faye Dottheim Brooks discusses the precious jeweled Torah shield that was looted from her grandparents’ home on Kristallnacht and returned to the family many decades later. Filmed at Spertus in 2014. A copy of the complete and unedited interview is available at the Spertus Asher Library reference desk. Dimensions: 10 1/4 x 9 1/16 in.